Highland kilts are worn and revered around the world. They are the focal point of full Highland Dress, and as such, are the most important part of Scotland's National Dress (arguably the most famous National Dress in the world). Premium quality Highland kilts are hand made, using eight yards of twill woven worsted wool,(preferably woven in Scotland). The weight of the tartan cloth, plays a big part in how the pleats of the kilt hang, and how they swing as you walk. 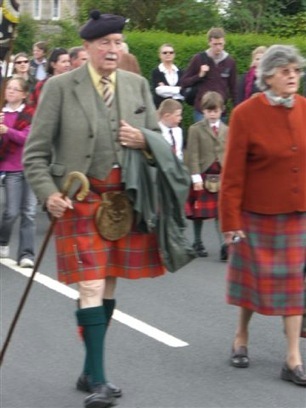 Below you can see a photo of the Chief of the clan McNab marching with his wife and other clansmen. It should be no lighter than 13oz, and preferably 16oz. When I say hand made I refer of course to the stitching, not only of the pleats, but to every other stitch that goes into the making of the kilt. The pleating is also done entirely by hand, including having them hand pressed, when the kilt is completed. Unfortunately some kilt makers these days claim to be offering "hand made" kilts, when in fact most of the stitching is done by machine, with only the finishing touches being done by hand. So what's the difference? I hear you ask. Well the difference is in the time it takes to sew your kilt by hand, compared to the time it takes to make one on a machine. A kilt maker can save between ten and fifteen hours when making a kilt on a machine, so it pays to ask him or her, "will my kilt be sewn by hand"? Don't forget we are talking about thousand of stitches that go into a hand made kilt, and when sewn by an expert kilt maker, these stitches, most of which are invisible to the naked eye, will stay in place for decades. Thus enabling your kilt to become a family heirloom, which can then be passed down through several generations. Also traditional Scottish kilts are made to measure, and not available from stock, they are bespoke, custom made quality garments. This is of utmost importance if you wish your kilt of fit you properly, so do make sure to have your measurements taken by your kilt maker. Or if ordering online be sure to follow the measuring instructions to the letter. Because of the amount of work that goes into making your kilt, allow at least five weeks for delivery, often longer depending on the time of year. And while it is true that such a kilt is expensive, it is none the less exceptional value for money, and will ensure that you are always immaculately dressed for any occasion. If you have any questions regarding this page, or would like to comment on the web site in any way, please contact me using the Contact Us page, I love to hear what my visitors have to say.